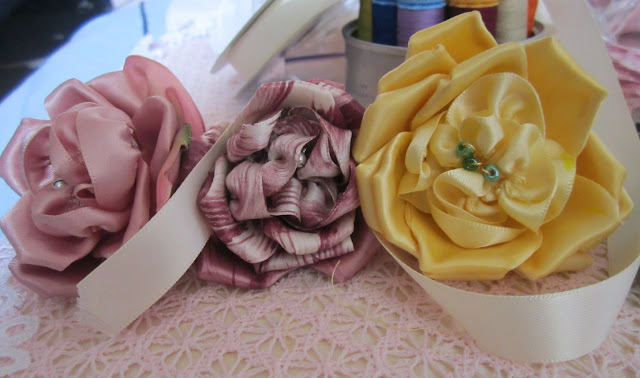 Three dyed polyester ribbon roses. 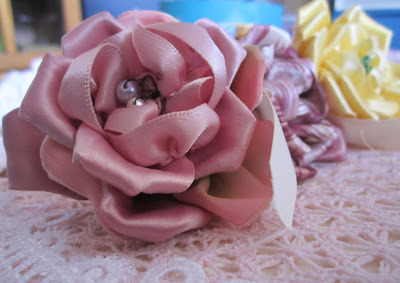 Today I did not dye ribbon! I thought about it but they objected! So instead I worked on making flowers out of the ribbon that I had dyed the last few days. I can usually manage one rose a day, but have made 3 in 2 days! The golden ribbon made a really beautiful rose. But the petals being all one shade made it a tiny bit dull. The green glass beads add a bit of interest. I am considering shading it with fabric markers. 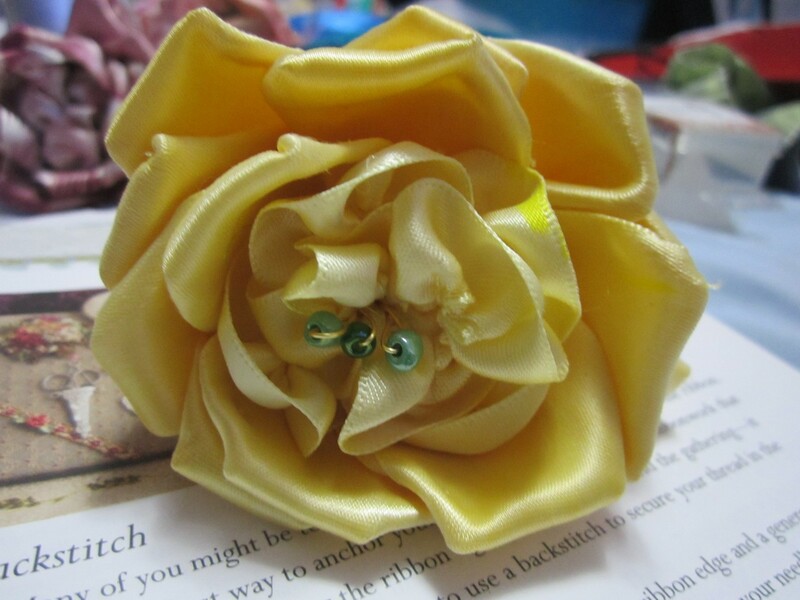 Sunny yellow dyed polyester ribbon rose. The wine colored ribbon did come out two slightly different shades and that gave it more depth. I used a pearl center and in the last row added some petals that had a pink to green shading. Very pretty rose. Wine dyed polyester ribbon rose. 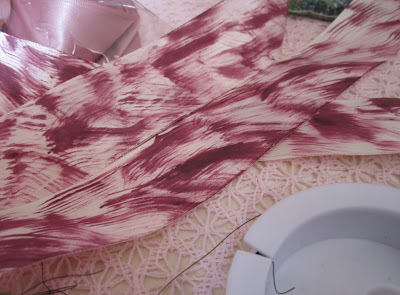 Last night I took some Fabric paint in Berry Wine and painted the wine dyed ribbon in streaks using a chenille stem. For the u-gather center I streaked some off-white ribbon. 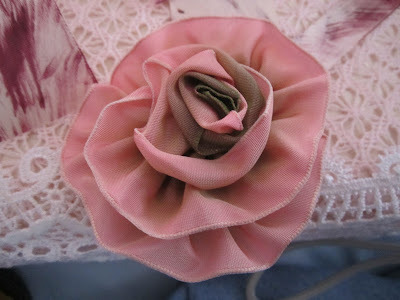 In the last row I added some simple wine colored petals. It made a pretty striped rose. Berry Wine fabric painted polyester ribbon. 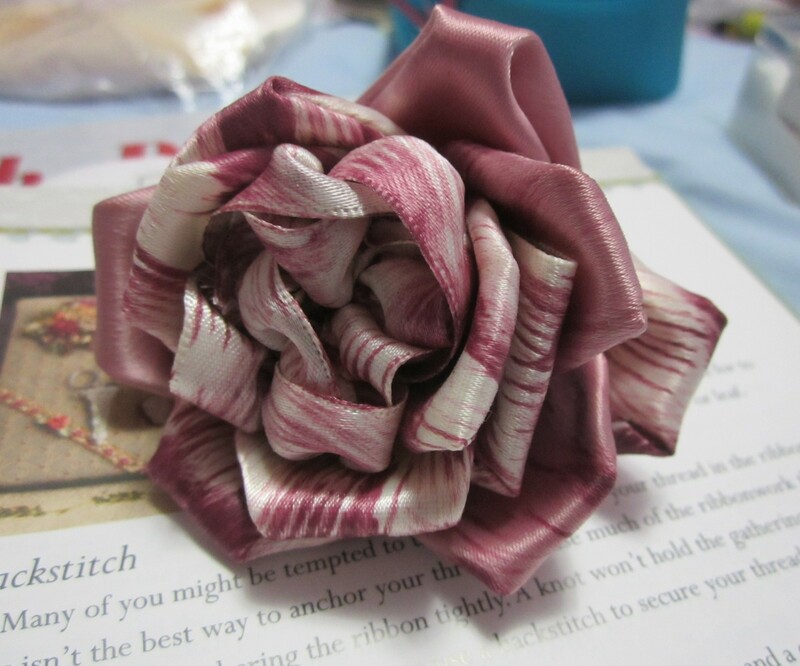 Wine dyed and berry wine striped polyester ribbon rose. Also I was able to make a coiled rose! It was easy once I thought it out. The center should have more gathering using small stitches and as it is worked down the ribbon the stitches get longer making it less gathered. Before I had not used enough ribbon so the effect was strange, It will make a beautiful rose on a hat or maybe my black jacket. The computer and the camera are not speaking and a black piece of plastic fell out of the computer. So no pictures tonight. Knowing my luck Nessie will come to the side door and eat the cats. And I won't be able to post a picture!